The end of the semester has sure been hard on my blog. Oh well. Onward and upward. One of the pleasures of moving is experiencing a new culture with child-like curiosity. There’s real joy in being an innocent, unencumbered by the cynicism that comes with familiarity. I’m sure that certain things about the Athens, GA area will eventually wear down my resistance to bitterness, but I’ll fight that dread fate until the end. What helps in my efforts for now is the fact that I possess two small children, 8 and 4, and their wonder naturally becomes mine. From my youngest’s fascination with Southern accents (“Mommy, I speak English, but I don’t speak y’all”) to my eldest’s wholesale adoption of cowboy boots as essential fashion, I am constantly reckoning with this new culture and landscape, and this has been blissful. The song is catchy and enigmatic and weird and wonderful. One of the great pastimes of my generation was reciting the lyrics – making sense of the rapid-fire rhymes and idiosyncratic references was, if successfully pulled off, a trip to the Bank of Cultural Capital. If you were privy to the song’s secrets, you had what the kids today like to call “street cred.” In short, it captures that most imperceptible element, the “coolness” that Athens contains within its city limits. Hearing it again, freshly, through my daughters’ four ears, has been been an intellectually stimulating experience as well. It’s lyrical rejection of paranoia as a motivating political tactic was powerful enough in the throes of the Cold War. (This is a theme throughout the entire Document album – see “Exhuming McCarthy). Today it is an essential defense against our public discourse. In our time, and to a degree that Michael Stipe and company could never have imagined, paranoia and fear are co-conspiring kings. Perhaps it is because of 9/11. Perhaps it is because conspiracy has become big business. The fact is, now more than ever, the most important decisions we make as a society are driven by fear and that is truly frightening. (Yes, the irony of that sentence is purposeful). The profits of cable news depend on the motivation fear provides, and the networks therefore have no qualms about packaging and selling conspiracy. It is a money machine. This is, quite simply, a cultural disaster. Caution and suspicion are not inherently bad things. In fact, when kept in check, they provide a vital conscience for both the individual and society. Fear is an instinct that has helped humankind survive from The Great Flood through Y2K, but its proper place is at the margins of life, not the center. When thrust into the role of a life’s organizing principle, fear is crippling and destructive, forcing the individual to hide away from the world and forgo much of the experience that makes life worth living in the first place. Indeed we are being sold fear, and consumer demand is high. This is a crisis we all now face. Together. For all the good and great things the Enlightenment has brought us, this fascination with the individual has gone too far. We are more than individual consumers whose fates are our own concerns. George Costanza said it best, I think, when he said, “you know, we are living in a society!” Instead, we have drifted off, too far, into our own imaginary islands and left the very real mainland to rot. And it’s more than that we’ve simply drifted. We’ve fled one another’s great company. R.E.M.’s song offers the wisest advice I can think of to confront this crisis. “Offer me solutions, offer me alternatives, and I decline. It’s the end of the world as we know it. And I feel fine.” In other words, don’t worry so freakin’ much. The video that accompanies the song captures its essence as well as any could. The boy rummaging around the deserted shack in the wilderness, the end of civilization as it were, neither weeps nor gnashes his teeth. His forebears have left him ruins and rummages through them them with curiosity and humor. Then he skates among them. We find ourselves in the same position as that boy. Our fathers and mothers have left us messes to clean up, as theirs did for them. There are problems to be solved and there alternatives to be chosen, but there is some joy to be found in the process. And isn’t it better to go through it with other people? My family has staked out Athens as the place where we’ll make our stand. It is different from what we’ve known. We came here alone. Scary, but hey, we have R.E.M. to guide us. Coming up on our first year here, we can see a lot of progress in making this strange place our home. But, our strategy has not been installing security systems and building safeguards. It has been risk. It has been getting to know people. A place is not just its landscape and buildings, it is its people. Bad things will invariably happen to us as they do to everyone, but we will not be alone as we face them, blaming the hands of unseen and non-existent conspirators. Life is with people. The past year has, in fact, been the end of the world as we knew it. In previous posts, I’ve confessed to a weakness for “speculative documentaries.” You know, Bigfoot, the Loch Ness Monster, U.F.O’s, and all their friends in the crypto-zoologicaspere (I should copyright that term!). 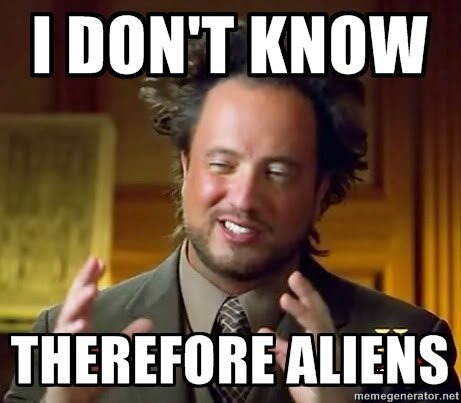 One program holds a special place in my heart, however: Ancient Aliens. As I’ve shared previously, this program performs a dizzying array of death-defying rhetorical shenanigans, and is so utterly removed from the logic that binds the rest of us to reality that I thoroughly enjoy watching it. At its heart though, I think my love of the show’s antics is a love of rhetoric. I watch the crimes that Mr. Giorgio and company rhetorically perform against humanity and, like Superman, my argumentative mind springs into action. “This would be great to show my students!” I think aloud. Uh oh. I think you see where this is going. Unlike a lot of literature types out there, I personally don’t mind teaching freshman composition because, to me, the construction and expression of arguments are a vital part of what makes us beautifully and insufferably human – I believe rhet/comp to be central to any liberal arts education. With those lofty goals, the argumentative gymnastics of a conspiracy-ridden mind are gold, Jerry. Gold! Step One: What’s Wrong With This Picture? I showed this video to my classes today, after confessing my love for conspiratorial narratives. I told them about the all-encompassing grand narrative of the Ancient Alien types – how the Annunaki supposedly came down and created human beings to mine Gold for them et cetera. (Here I should point out that this video is not connected to the program Ancient Aliens – it simply shares the same mythos). Then basically anything that ever happened after that is part of the alien conspiracy. The whole bit. I admitted some shame in knowing as much as I do about the “theory,” then I asked them to watch the above video and take note of some of its particulars to specifically argue against. The key phrase was “specific.” I stressed that they were to identify concrete formal and rhetorical structures that they could then analyze for their function and overall effect. The conversations we had were excellent. Several students pointed out the problems with zooms that pushed beyond what pixel limits of the original video would allow. Still others argued that the abundance of rhetorical questions simply plants ideas in the views head and tempts them into making false assumptions. Others pointed out that the computer generated narrator-voice makes attribution impossible and that the script could have been written by a ten-year-old boy and we would never know. 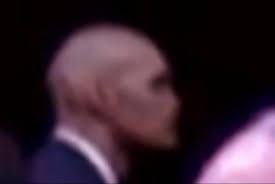 One canny student observed that the application of a video filter that resembles a heat-sensing camera falsely suggests that the poor secret service agent is a reptilian. She noted that the heat sensor would have had to have been a part of the original video for that gimmick to work. I was proud of my rhetoricians in training. They noticed many things that I did not, and we had a series of terrific conversations about writing. Most importantly, I tried to stress that when they are engaged in argumentative writing, it really helps to have something to, you know, write about. By not simply relying on their initial, general impressions – “Are these people serious?” “Don’t they know that they sound crazy?” – they made it possible to have a productive conversation. In short, identifying concrete things that present problems gives the writer something to write about. I then urged them to take the same approach with their current research projects. My Personal Response to the Video: Aliens? Maybe. Anti-Semitism? Yep. Before moving on to the next topic of the day, I offered my own response to the video, re-enforcing the fact that my response was only really possible after identifying specific, problematic elements in the video’s argument. Now I’ll share it with the internet. 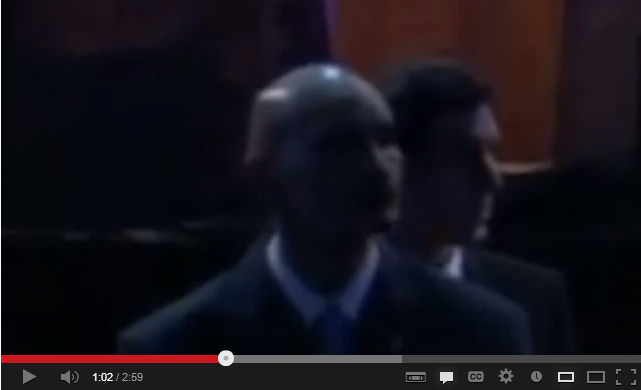 This video is a raging, syphilitic case of anti-Semitism. 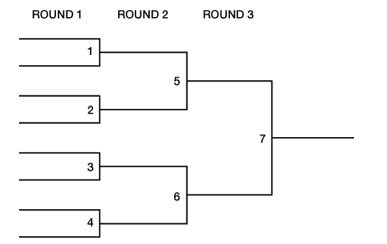 The argument is clear. The video exploits its deceptive rhetorical tricks to suggest (without actually saying outright) that not only is there a Jewish conspiracy, but the Jews themselves are more closely aligned with the aliens than with the humans. This, of course, goes back to anti-Semitic rhetoric that spans the ages. The oft-debunked Protocols of the Elders of Zion is a model for this type of deception and, incredibly, there are still people who believe in its truthfulness, as I’m sure there are people who believe the claims of this 3 minute video. This video is not simply mindless stupidity, it is ugly hate speech packaged for weak-minded conspiracy theorists. It is dangerous if we don’t pay attention to how it makes its arguments. 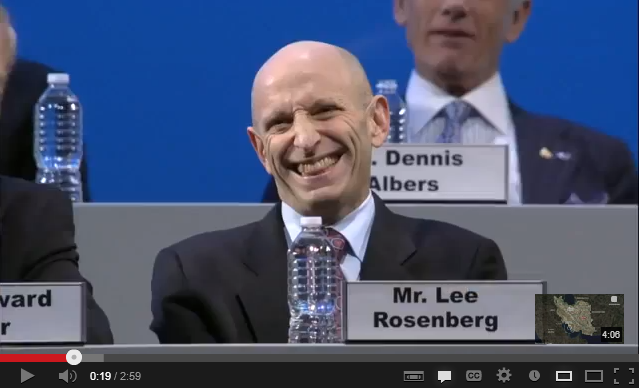 Oh, and in the wake of the Boston Marathon bombings, look at this. At any rate, I used this as an example of the importance of paying attention. Passive consumers of information are prey to dangerous minds, and may become dangerous themselves. Active readers have the benefit of an insight that is not only advantageous, but also a moral obligation. English class may not always be thrilling, but the lessons we’re trying to teach you are important. Unless, of course, I too am one of the Annunaki, sent here to confuse my students and keep my race in power. I am bald, you know. Being a new citizen of Georgia, I’ve relished experiencing its culture for the first time. From chicken farms to the great BBQ debates to the local pro wrestling scene (more on this later, I’m sure), it’s all been dazzlingly interesting. So much so that I’ve decided to make my observations a semi-regular feature of this blog. How our patron saint Matthew Arnold fits in, Lord knows. Perhaps this is the anarchy part of Culture and Anarchy. 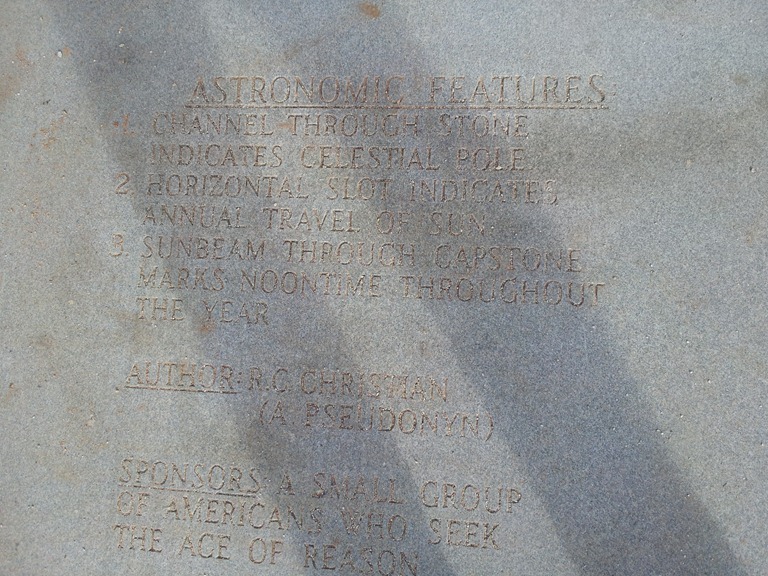 Episode one is the Georgia Guidestones (pictures by Yours Truly). 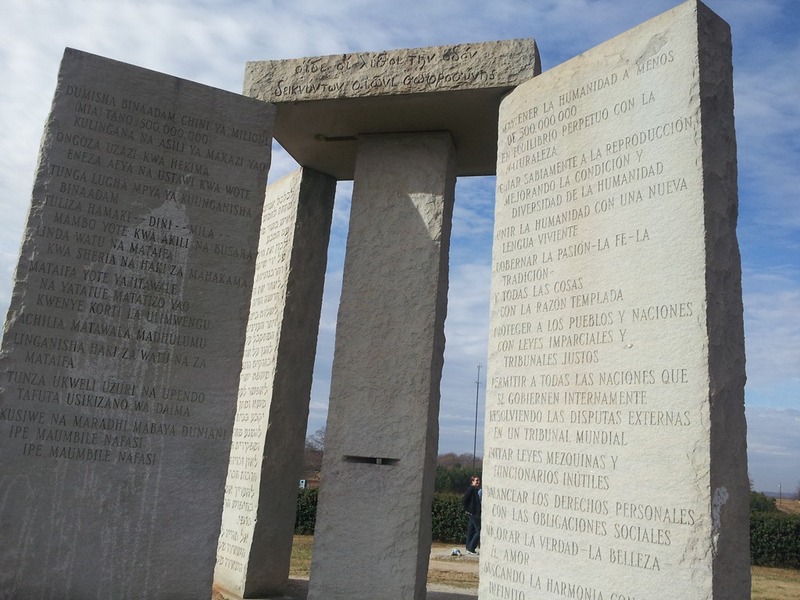 For those of you unaware of this cultural oddity, the Guidestones are a Stonehengey-like monument located in a field in rural Georgia (happily only 20 minutes from my house!). They were anonymously designed and constructed by a man known only by the pseudonym R.C. Christian, and their purpose is a source of vast controversy and eschatological speculation. I first saw this monument on an episode of Brad Melzer’s Decoded (back when that streamed on Netflix) and was excited to find out that I would be neighbors with a menacing sign of apocalyptic doom. 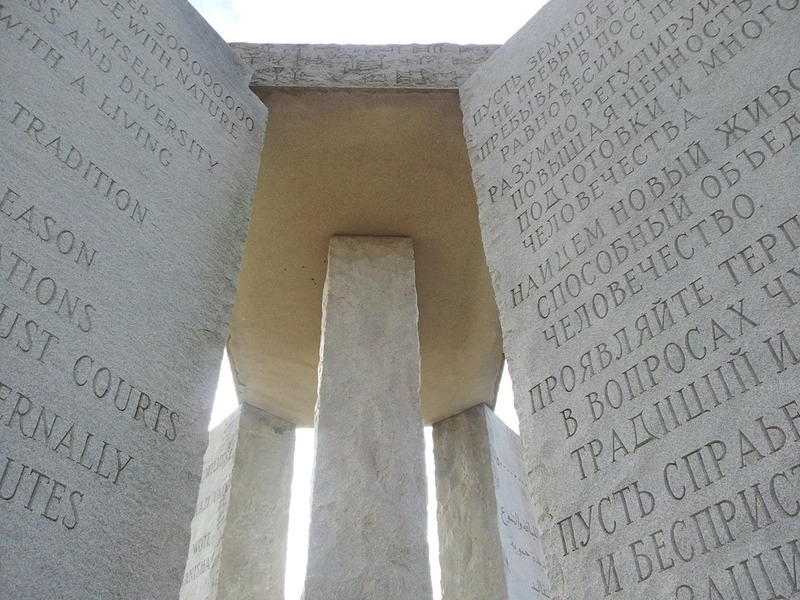 To quickly summarize, the big issue seems to be a combination of the apparent Rosicrucianism indicated by the Guidestones anonymous patron (R.C Christian –get it? 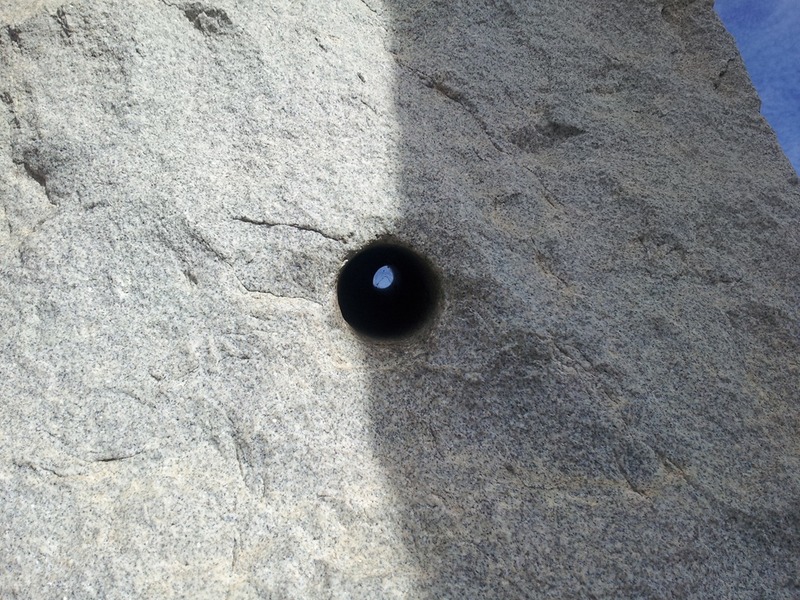 ), and the strange message the stones convey. 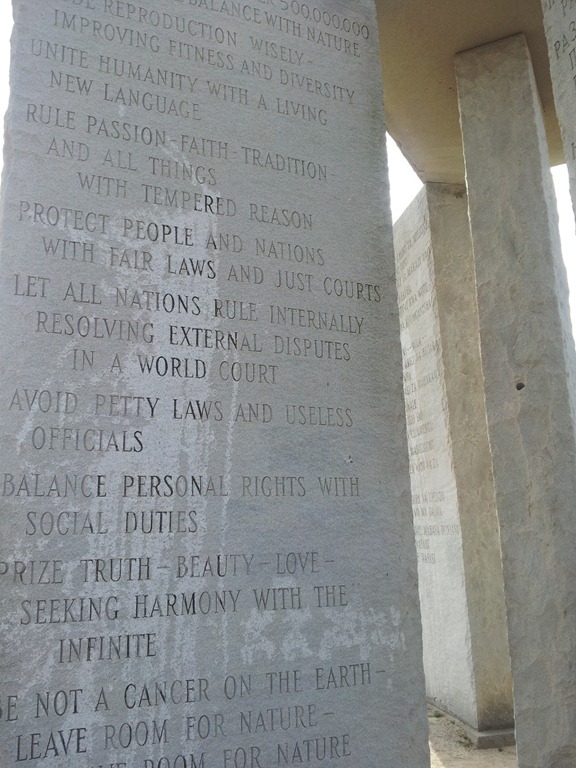 They basically lay out 10 commandments for a new world order. Unfortunately, my photo cut off the Big One – the first commandment, which is to “Maintain humanity under 500,000,000 in perpetual balance with nature.” This of course implies bad news for the New Earth’s 500,000,001st person. It also stokes fear among the conspira-rati, who see New World Orders and secret societies under every anonymously-engraved rock-and-bull story. 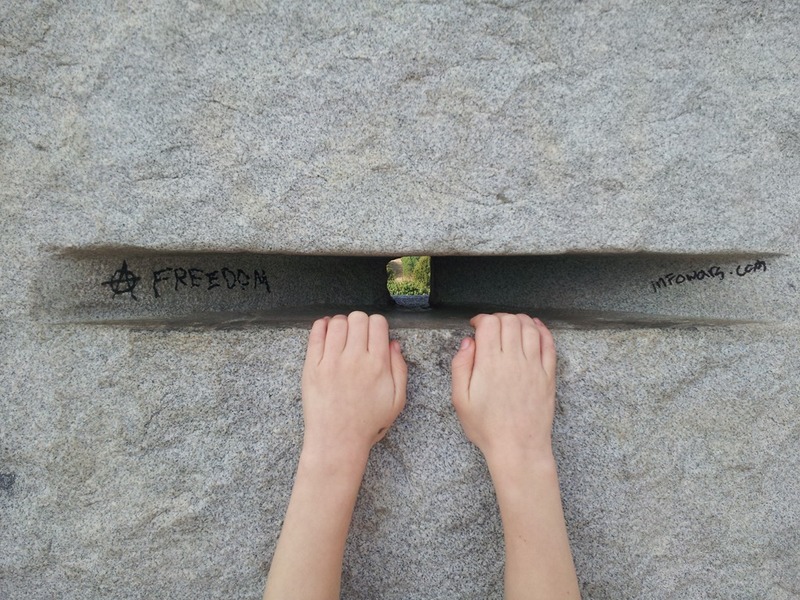 The Guidestones do, in fact, have a rhetoric of ambitious power carved into its Elbert County granite. 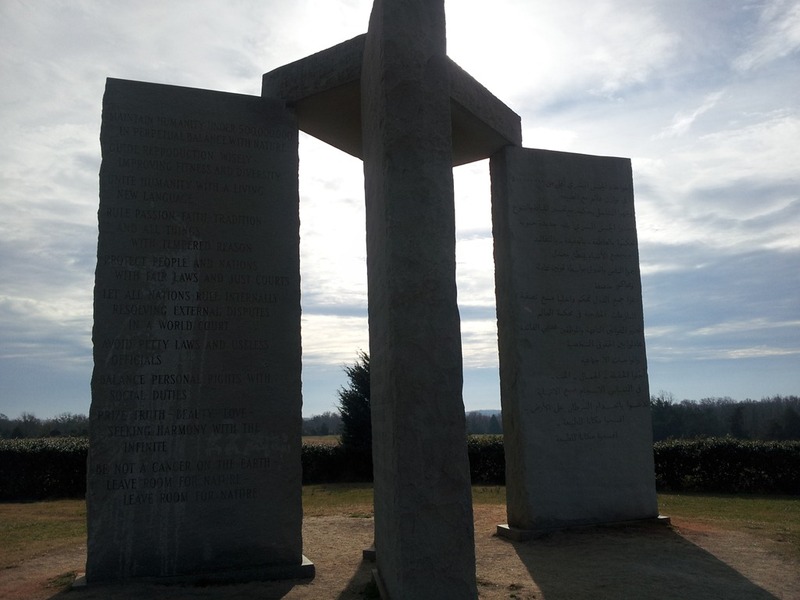 But – and not that I don’t love my new home – how this monument is supposed to guide a new race of Super-Men from a desolate field in rural Georgia is a question I haven’t seen an adequate answer to yet. And one with my daughter climbing on them (of course – what else would she do with such a thing?). So billions of those searching for enlightenment can find it handily translated into their native tongue. Again, though, just how many speakers of Swahili and Russian will pass through Elberton, Georgia looking for “Guidance,” I’m not sure. I suppose this neatness and clarity is the main problem I have with the whole project. Where’s the mystery? 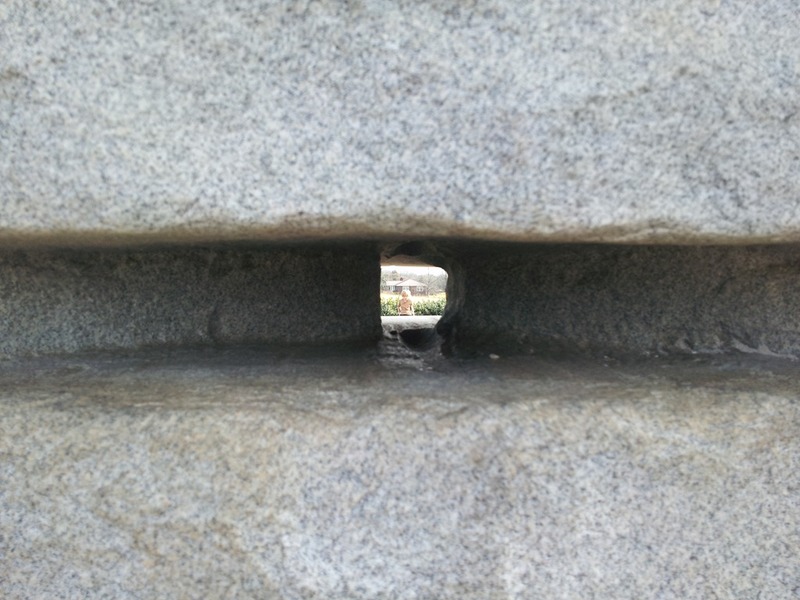 Unlike ancient, enigmatic Stonehenge, we have a detailed description of how it works. How can the Spinal Tap of 1000 years from now incorporate this into its inept stage show if there is no mystery to stoke its members’ imagination? Also, as seen in the above photo, under the heading “Sponsors,” we are told that they are “A small group of Americans who seek the Age of Reason.” Great. The New World Order will be all about Cold Hard Facts. And militant birth control. Not that Reason in itself is a bad thing; we most certainly could use more of it in our current state, but the emphasis of this monument’s architectural rhetoric leaves no room for imagination, and this is where life is lived to its fullest (I guess I’m finally making the link to Arnold here). Tempered Reason as the solution to all the problems caused by not only blind religious faith, but also by our loves and imagination. Methodical, Vulcan reason as antidote to our venomous, irrational humanity. I understand that it’s now orthodoxy to look down our noses at Religion and such things (this is a debate I don’t wish to engage in at this moment), but extending that to Passion? What would the world be like without passion? Limited to the mechanical measurements of 500,000,000 dull technocrats, I say. This deification of Reason confirms my biggest fears about the New Atheism. Once they take down Religion, who do you think is next? Bye bye Shakespeare. Whatever threat that Religion poses for Reason is inherent in the Humanities as well. The life of Faith and the life of the Mind share an elegant, symbiotic dance. This is, I think, some of the point Terry Eagleton was trying to make in his hilarious response to the God-debates in the book Reason, Faith, and Revolution. The Jeremiad tone I take here is, of course, somewhat hyperbolic. I understand for instance that Christopher Hitchens lived an enviably imaginative life. I just hope that come December 22, the survivors have a say in amending R.C. Christian’s Bill of Rights and Responsibilities. 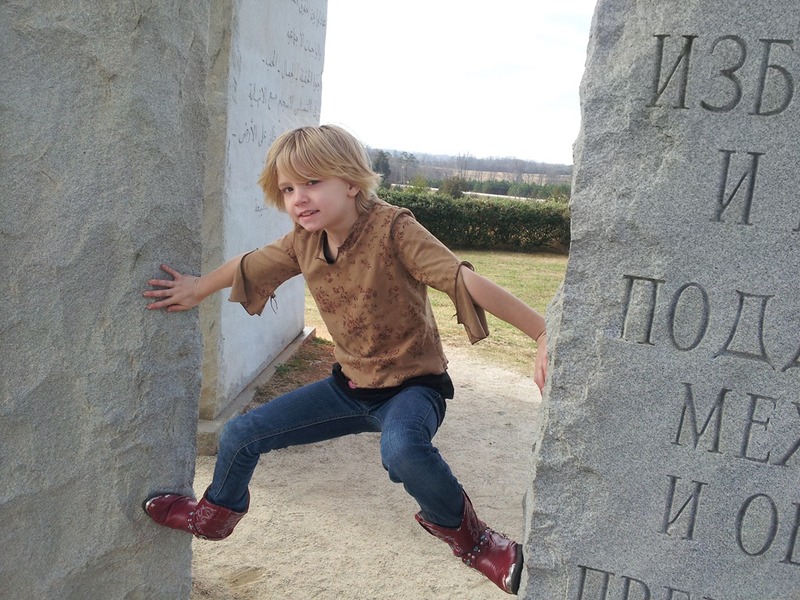 This is why I love the picture of my energetic, irrational, beautiful daughter using the Guidestones as a jungle gym. It is the best use of these guidelines we can hope for. I’m all for Reason, but not at the expense of Magic. The anarchist graffiti was there when I showed up. Honest.